Orange has a faint smell resembling Chuckles. 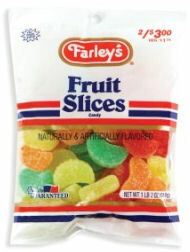 The jelly piece is viscous, but not overly so, allowing for an easy bite and nice texture for a gummy. This flavor lacks the citrus of a real orange, but it is a pure orange flavor compared to their orange sherbet flavor in the fruit chew. I canâ€™t really taste the light sugar coating, but this piece was enjoyable overall. Strawberry has a strong smell, reminding my of strawberry Fruit by the Foot. This piece is a little softer than the orange, making the texture not as satisfying. The strawberry taste itself is artificial, missing even the basic flavor, and leaves my mouth with a waxy and bitter aftertaste. Lemon has a pungent smell, like Lemonheads. The taste is reminiscent of lemon, but there is absolutely no citrus to this piece, which makes the lemon flavor collapse. Cherry had no smell to it, and that is because the flavor is reminiscent of cherry cough syrup. It lacks the sweetness coupled with sour taste a good cherry flavor possesses. Grape is the same Kool-Aid/Bubble Tape flavor the fruit chew retains. If youâ€™re a fan of 90s grape candy, you’ll enjoy it. Any other generation will wonder how grape got so off-track. Apple’s flavor is subtle, which is a shame because apple is such an underused flavor in candy. The minuteness of it makes it overpowered by the bitterness I tasted in all the other flavors, something I am guessing is inherent of the gelatin. Surprisingly, the orange flavor was the best of this bunch, something I rarely say since I generally dislike anything orange. That is probably a good thing since they sell that flavor individually as its own line, saving the time of fishing out all the orange pieces from a barrel of these. Milk Maid Royals Flavored Caramel Rolls are rich and creamy caramel rolls made with real milk, then filled with six different flavors of creme. These pieces are the same size as the fruit chews. Like those, they arenâ€™t sticky and are rather easy to bite into, which is surprising for caramels. Vanilla offered no vanilla flavor, as the caramel overwhelmed any presence that might have been infused. It was still a good caramel piece nonetheless. Orange mimics the syrup they use for the orange fruit chews. Though I didnâ€™t mind it in the fruit chew form, the orange sherbet flavor does not mesh well with caramel. Chocolate is bold. Inside of the caramel is a strip that borders a Tootsie Roll in flavor. Though I think chocolate and caramel go well together, when caramel is the main ingredient, the chocolate competes unsuccessfully for attention. The fact that it tastes like mockolate doesnâ€™t help either. Butter rum is dripping with potent alcohol intensity (think butterscotch schnapps), odd since there isn’t any in them. If you are a fan of butterscotch and liquor, youâ€™ll enjoy this flavor as it complements the caramel. It was a bit too intense for my liking. Maple resembles the vanilla and orange in the sense that rather than have a strip of chocolate or butter rum wrapped in caramel, the flavor is mixed into the caramel. The flavor is spot-on, but not overly sweet. Maple fans will enjoy this. Raspberry has a pink strip covered in caramel. Raspberry seems like bad choice to blend with caramel since it tends to be a subtle flavor and easily could be overpowered; however, the flavor is subtle, but definitely detectable, although more as a fruity floral overtone than as an obvious raspberry presence. On the whole, these werenâ€™t bad. If youâ€™re a fan of regular caramels, then the added infusion of these flavors will probably offer you a renewed way to enjoy your favorite treats; if you just eat caramels when offered them, you can pass on these. Overall, I found these products to be more successful than the last batch I reviewed, but none were anything that would tempt me into regularly buying. 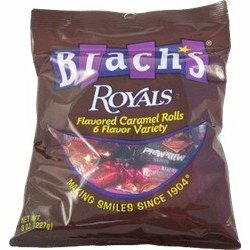 Brach’s manufactures about a 100 more products, so there’ still plenty of time to find the ones I like.